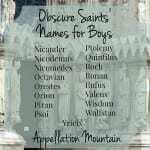 Who says there are no new names for boys? This undiscovered gem could be a perfect pick in 2016. 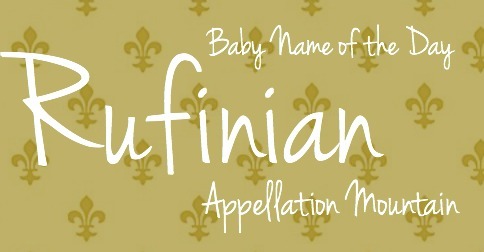 Thanks to Zuleika for suggesting Rufinian as our Baby Name of the Day. You’re forgiven if you imagine that Rufinian is a smoosh of Rufus and Finn, with the -an ending tacked on. Maybe it could be, but it just isn’t. Instead, this is a rarity with history galore. Rufus comes from a Roman cognomen, originally a nickname of sorts, usually given to someone with red hair. There’s a Rufus in the Old Testament. King William II of England is typically known as William Rufus thanks to his red hair. Rufinus is another form of Rufus used in ancient Rome. There were early saints known as Rufus and Rufinus. Then came Rufinius, a form of the name used later in Roman history. And then there’s Rufinianus, an elaboration of an elaboration. Rufinius and Rufinus are more common in the historic record, but the full -inianus ending is found, too. 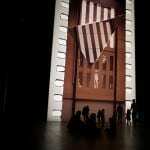 There’s a third century senator or two, and a few military officers, dating to around the same time, give or take a century. A Catholic bishop by the name appeared at the Conference of Carthage in 411. It’s said that brothers Rufinus and Rufinian were martyred during one of the early persecutions, making this a saint’s name, too. There are also two sisters from Seville, Justa and Rufina, martyred during the 200s. It’s a family of names that doesn’t have much history today, but once may have been as familiar as names related to Alexander are today. So there’s history aplenty for this name, but it all-but disappeared sometime after the year 400. 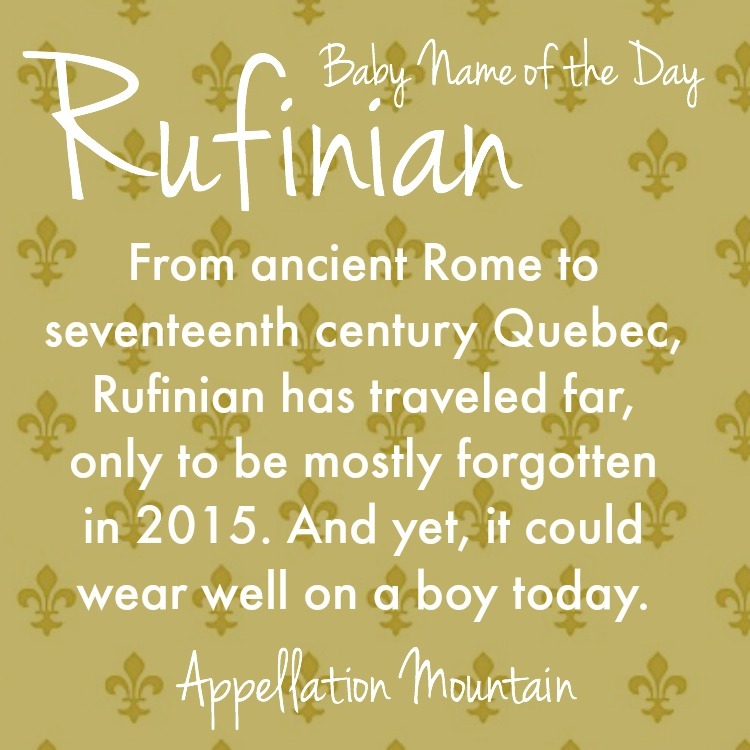 I found Rufin listed on this list of Acadian names, and – jackpot! – a Rufinian on this genealogy site, for a Quebec family. It doesn’t appear in my go-to for French names, Meilleurs Prenoms. But then, not every name popular in Quebec over the years necessarily does. Apparently, longer ends in -n, -nd, and -nt were popular in French-speaking Canada. I’ve covered a few other names that seem specific to French settlers in the New World, like Trasimond. 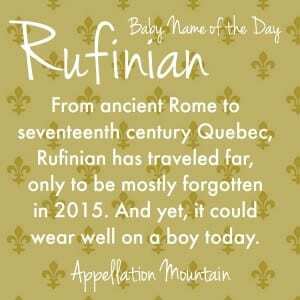 This resource lists both Rufinian and Rufinien as names used in Quebec. An early bishop of Avignon was named Rufus. Maybe that’s why the Ruf- names are popular with French families? In the US, there have never been even five boys named Rufinian in a single year, and I couldn’t find even one in the 1940 US Census. It falls somewhere between Roman and Sebastian, sound-wise. Longer, more elaborate names like Santiago are mainstream in the US today. There’s at least one obvious, built-in nickname: Finn! Ian might also work, too, or possibly Rufus – though it’s hard to think of Rufus as being short for anything. 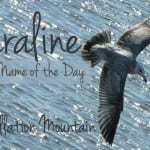 It’s definitely one of the rarer names covered at Appellation Mountain, but I think it’s on the right side of wearable. What do you think of Rufinian? Is it too out-there to consider for a child’s name? We named our first son Ruffin James in 2014. It was a family name for a three generations but skipped two generations before our son was born. It’s a strong name for a strong, fiery child and I believe it will work well for a man. Otherwise, he can just decide to be Jim. What a great name, Meghan – and how great to find such a gem on your family tree! *next generation. I’d happily have a grandson named Rufus! I think it looks too much like ruffian.